Description: Elastic pen loop. Tab and loop closure. Blue and silver ribbon page markers. Business card slot. 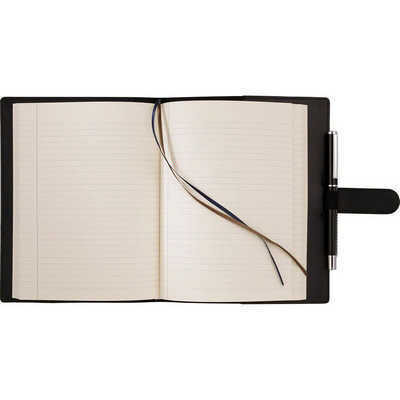 Features: Includes 128 sheets of lined JournalBooks refill writing pad size 170 x 241mm. Pen not included. Packaging: Polybag. Colour: Black Material: Italian UltraHyde Product Size: 254mm(h) x 177.5mm(w) x 25mm(d). Freight details: 20 per carton, 12.8kgs, 39.50 x 26 x 28cms; Decoration Type(s): Colour Print / Deboss / Debossed Foil / Foil Stamp / Full Colour Print . Decoration Area: Pad/Screen/Emboss - 101mm(h) x 76mm(w). See drop down menu for decoration options.